Other methods for safeguarding machines include guarding by location or distance and by feeding methods that prevent operator access to the point of operation. Safeguarding by location involves positioning or designing a machine so that the hazardous parts are away from areas where employees work or walk, or alternatively, installing enclosure walls or fences that restrict access to machines. The feeding process can be safeguarded by distance if the operators maintain a safe distance between their hands and the point of operation. For instance, if the stock is several feet long and only one end of the stock is being worked on, the operator may be able to hold the opposite end while performing the work. Safeguarding by distance is sometimes used during power press brake operations to ensure its effectiveness. This method of safeguarding requires close supervision and training. § Magazine feeding, where the worker places the part in a magazine which is then fed into the point of operation. Automatic and semiautomatic ejection methods include pneumatic (jet of air), magnetic, mechanical (such as an arm), or vacuum. Operators can use tools to feed work pieces into equipment to keep their hands away from the point of operation, but this should be done only in conjunction with the guards and devices described previously. Using hand tools requires close supervision to ensure that the operator does not bypass their use to increase production. Tools should be stored near the operation to encourage their use. To prevent repetitive trauma disorders, hand-feeding tools should be ergonomically designed for the specific task being performed. Foot controls are not safeguards because they do not keep the operator’s hands out of the danger area. If you use them, they will need some type of guard or device, such as barriers or pullouts with interlocks capable of controlling the start up of the machine cycle. Using foot controls may increase productivity, but the freedom of hand movement allowed while the machine is operating increases the risk of a point of operation injury. Certain machines can be categorized based on the type of clutch they use — full-revolution or part-revolution. Differing modes of operation for these two clutches determine the type of guarding that can be used. Once activated, full-revolution clutches complete a full cycle of the slide (lowering and raising of the slide) and cannot be disengaged until the cycle is complete. So, presence-sensing devices may not work and a worker must maintain a safe distance when using two-hand trips. Machines incorporating full-revolution clutches, such as power presses, must also incorporate a single-stroke device and anti-repeat feature. The part-revolution clutch can be disengaged at any time during the cycle to stop the cycle before it completes the down stroke. For example, part-revolution presses can be equipped with presence-sensing devices, but full-revolution presses cannot. Likewise, hydraulic presses can be stopped at any point in the cycle, and their safeguarding is similar to guarding for part-revolution clutch presses. 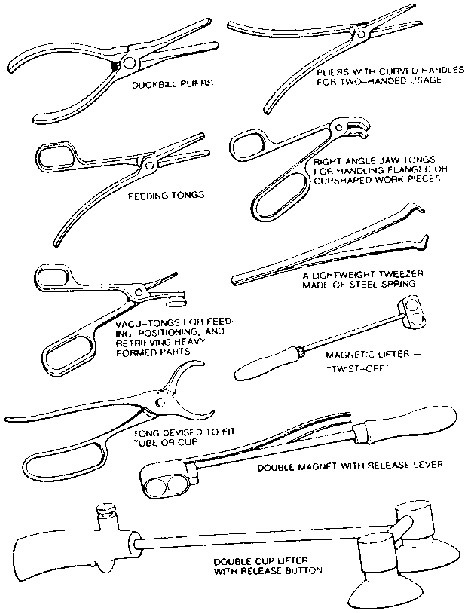 Special hand tools may be used to place or remove stock, particularly from or into the point of operation of a machine. A typical use would be for reaching into the danger area of a press or press brake. 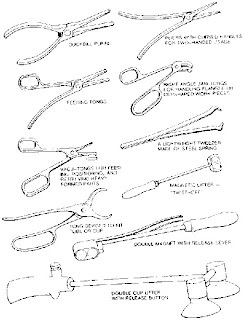 Figure 1 shows an assortment of tools for this purpose. Holding tools should not be used instead of other machine safeguards; they are merely a supplement to the protection that other guards provide. A push stick or block, such as those in Figure 2, may be used when feeding stock into a saw blade. When it becomes necessary for hands to be in close proximity to the blade, the push stick or block may provide a few inches of safety and prevent a severe injury. In the illustration, the push block fits over the fence.